Are you getting ready for for your camp program in the U.S.? It may not be time to start packing just yet, but it is a great time to start planning your packing list and potentially shopping for any items you don't already have. It's important to pack light! Remember that you will probably want to buy clothes and souvenirs when you are in the U.S., and if you plan to travel around after camp, it will definitely be easier if you travel lightly. Try to pack in a large backpack rather than a suitcase. First, and most important, bring your passport, J-1 Visa and DS-2019 Form! You cannot get into the country without them so make sure you have them in a carry-on bag, not in the luggage you check-in. You should make a copy of each of these documents and keep them in a separate bag, just in case you lose your originals. The following is a list of suggested items you should and should not bring with you to the U.S. You can also contact your camp for a more specific packing list. Money: Bring a minimum of $250 to cover travel, food and other expenses. You should come prepared with enough money to cover initial expenses when you first arrive in the U.S., as you will not receive your first camp payment until after you've begun work. Toiletries: Shampoo, soap, a toothbrush, toothpaste, a razor and deodorant are essential. You can buy a supply for the duration of your program once you arrive in the U.S., so just bring enough for one week. If you pack liquids in your carry-on luggage, you are not permitted to have more than 3 oz (88 ml) in a bottle. Medications (pack in your carry-on luggage): You should bring enough medication for the entire time you are in the U.S. Also, bring a note (written in English) from your doctor indicating the type of medicine you need, just in case you lose it. Your camp will require you to store your medicine at the infirmary. You will be able to pick up a dose of your medication as often as necessary. Shoes: Sneakers or trainers are mandatory. Do not buy the nicest, most expensive sneakers you can find. Instead, bring your old pair. Sneakers are relatively cheap in the U.S., so if you need a new pair, there is no better place to buy them! You will also want to bring a pair of flip-flops to wear to the pool or lake, and in the shower. Clothing: You will need to bring T-shirts and shorts for the daytime, and jeans and at least one sweatshirt, jumper or light jacket for the evening. Remember that it can get very hot during the day but very cool at night. The clothing you bring should not be new or expensive. Also bring a nice outfit for parties at camp or outside on your days and nights off. This outfit must be appropriate for you to wear around children, even if you plan to wear it in the clubs of the big cities after camp. Underwear & Socks: A week's supply of underwear and socks is essential. If you have room, you will appreciate a few extra pairs of each, especially if you unexpectedly fall out of a boat or walk through a puddle in the dark! Swimsuit & Towel: Often, camps will have a pool, a lake or both. You should bring at least one swimsuit and one towel with you. Your bathing suit must be modest and appropriate for camp. Leave your thongs and Speedos at home! Sleeping Bag (optional): Many camps send campers and staff on overnight trips. On these excursions, your sleeping bag is all that separates you from the ground below. The sleeping bag will also double as an extra blanket on cool summer nights. Rain Gear: In addition to being hot during the day and cold at night, it rains, too. You will need a waterproof jacket and a pair of waterproof boots. Umbrellas are not always a good idea. Many camps are in the mountains, and umbrellas can attract lightning during a storm. Additional Items: We suggest you pack a flashlight (torch), watch, alarm clock (battery powered), money belt or pouch and your international driver's license. You might also want to bring a hat or visor, sunscreen and sunglasses for all the summer days you will spend outdoors! There are some items you definitely do not want to bring with you: expensive jewelry and family heirlooms should be left behind. Your camp may have a safe to lock them in, but you may not have access to a safe when you travel. You might also be tempted to bring your guitar overseas. It's a great thing to want to share your gift of music, but an instrument will get counted as a bag when you fly, and that will seriously cut down on your packing space. Instead, just bring your skills and borrow the camp's instruments! Think carefully about bringing an expensive camera to camp as it could get lost or damaged. Pack according to the job you will be doing at camp! If you are an adventure-training specialist, you may want to bring waterproof pants in addition to a waterproof jacket. Swim staff might want to bring 2 or 3 swimsuits. Do not bring insect repellent with you. The repellents created for use in your home country may not be effective in America and may actually attract bugs to you! When you arrive in the U.S., buy some at any drugstore or supermarket. 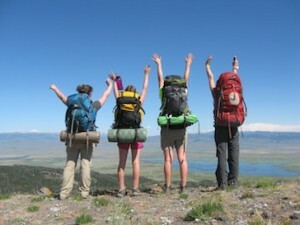 Many camps send a sample packing list to all staff members. You should be aware that these lists are usually designed for the campers and not for the international staff. You will quickly learn when you arrive at camp that the children may have brought more clothes with them than you even own! It is important not to over pack. If you do forget to pack an item, don't worry! You can buy what you need on your first day off or when you arrive in New York. Remember: If you are going to be upset if it is lost or ruined, don't bring it to camp!